Autoclave Water Supply Endless distilled-quality water in your sterilization center! Produces mineral-free (deionized) water for use in autoclaves. This water can be used for all distilled water applications. Electronic monitor advises when it’s time to change the filters. Works directly from municipal water. Multiple installation location options including under counter. 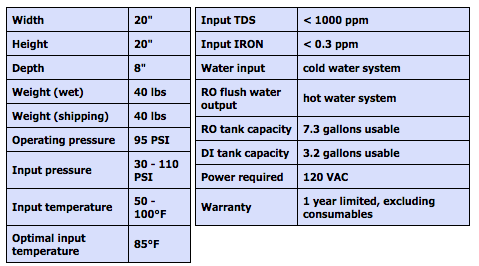 Tank capacity and faucet options. Economical – Creates distilled quality water directly from your municipal water supply for less than the cost of delivered bottled water. Reduced maintenance – Eliminates scale. Increases boiler energy efficiency. Green – Eliminate distilled water’s energy & landfill waste. Labor saving – Eliminates water bottle shopping trips & storage. Risk – Eliminate employee injuries from staging of large water bottles. Go GREEN and Save GREEN Eliminate bottled water in our lifetime. ECONOMICS – Mineral Mizer is economical, in most cases producing water for less than distilled water solutions. TABLE 1 shows the cost of operating the Mineral Mizer over for its expected 10 year life. The results are expressed in $/gallon of water produced, allowing a quick comparison against the practice’s existing solution. TABLE 1 shows the operating cost of the Mineral Mizer, excluding acquisition and installation cost. Many practices balance acquisition cost against gains in efficiency, convenience and staff safety of processing water on-site. However, for practices wishing to evaluate the economics without esoteric benefits, TABLE 2 includes both acquisition and operating cost. Economical – Creates dental water supplies directly from municipal water supply. Reduced maintenance – Reduces scale. Increases boiler energy efficiency. Manage risk – Comply with EPA regulation and ADA guidelines for dental waterline contamination. Green – Eliminates boiled distilled water. Zero-waste feature for water efficiency. Labor saving – Eliminates storage and staging of water bottles. Filtration system removes sediment down to 5 microns. Electric pump ensures peak clean water production even with low water pressure. Automatically shuts down during master water cut-off or drop in municipal pressure. Multiple 100 gallon per day reverse osmosis membranes squeeze out 95% of total dissolved solids (TDS) and undesirable compounds. Multiple water-driven pumps optimize clean water production, filling separate reverse osmosis and deionized water storage systems. Produces autoclave water with less than 1 ppm total dissolved solids. Zero-waste feature recycles reverse osmosis flush water into hot water system. No drain water! Plumbs to drain if office has a tankless water heater. Digital monitor shows mineral status of both RO and DI water. The HERO Gold includes a 10 gallon (7.3 gallons usable) high-flow storage tank, chrome faucet and a sterilization center manifold for RO water. The manifold includes a male garden hose fitting for hookup to the Meile instrument washer and a 3/8″ PTC fitting for the chrome faucet. The manifold connects to the RO water storage tank with 1/2″ PEX tube via PTC fittings, allowing equipment room installation of the HERO Gold. A 4 gallon (3.2 gallons usable) tank and red faucet for dispensing autoclave water are also included. 1. The HERO Gold does not heat water instrument washer water. This will increase cycle time for instrument washers lacking a separate deionized water rinse cycle. 2. The Miele instrument washer uses approximately 2.5 gallons of RO water per rinse cycle.